Fourth interpretation of the MINI Living Urban Cabin concept presented at the architecture exhibition China House Vision draws on traditional Beijing forms of housing as well as developing innovative ideas for maximum quality of living within a minimum space. 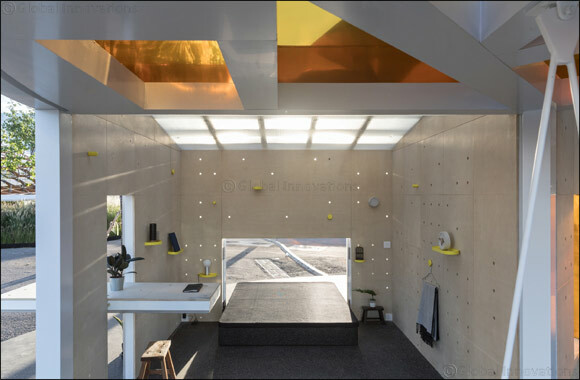 Dubai, UAE, October 01, 2018: MINI presents the latest MINI LIVING Urban Cabin at the interdisciplinary architecture exhibition China House Vision in Beijing from 21 September to 4 November 2018. The micro-apartment concept was developed in cooperation with local architect Dayong Sun. The Urban Cabin in Beijing is now the fourth interpretation of the concept developed by MINI LIVING last year. The Urban Cabin provides temporary living space with a high degree of flexibility and lots of possibilities – on a surface area of just 15 m2. One particular design focus is the local identity and culture of the specific location in each case. After stops in London, New York City and Los Angeles, the latest source of inspiration is Beijing. The central theme of the project is to explore how space can be used in an innovative way to create a new sense of community and maximum quality of living on a minimum surface area. In order to achieve this, the MINI LIVING Urban Cabin Beijing re-interprets traditional forms of urban living in China, thereby stimulating dialogue with community life in the city. MINI Living started in 2016 and is dedicated to developing novel residential concepts for urban conurbations worldwide. Developments in big cities such as space shortage and price increases are taken into account, as well as the desire for flexibility, local identity and communal interaction. In order to address these diverse aspects, the project takes the 'creative use of space' principle as developed for the classic Mini in the field of automotive design and applies it to the residential context. MINI Living Urban Cabin Beijing: visionary format with historical roots. Every MINI Living Urban Cabin consists of three formal elements. The living and sleeping sections on one side of the micro-apartment and the kitchen and bathroom on the other side are designed by the MINI Living Design Team. The third section is defined by MINI as an experiential space with the character of an installation: for each cabin, a local architects' bureau is invited to fill out this space. The theme selected always has to be relevant to the specific location. In Beijing this experiential space was developed in collaboration with local architect Dayong Sun. He has created an open area of encounter as a homage to the courtyards of the traditional hutongs. Golden, telescope-like mirrors are mounted above this interactive space, reflecting the immediate environment but also the broader urban context. A swing at the centre of the space provides a playful shift in the viewer's perspective. The storage and seating facilities positioned around the Urban Cabin are designed in geometrical shapes reminiscent of traditional Chinese tangram puzzles, also acting as an attractive feature for contemplation. Dayong Sun's design is inspired by the hutongs common in Beijing's more traditional districts. A hallmark feature of the city's architectural history, these residences are made up of courtyard buildings and passageways that are particularly appreciated for the combination of private withdrawal spaces and communal living areas which they offer. This model is now gradually disappearing from the urban landscape as a result of demographic change. The MINI LIVING Urban Cabin in Beijing echoes the underlying principle of hutong while at the same time translating it to the modern age. Global network of creative residential solutions. MINI Living is focused on forward-looking stimuli for a style of residential architecture that focuses on human beings and their need for individuality, flexibility and community. 'Each MINI Living Urban Cabin creates maximum quality of living within a very limited space in a specific situational context', explains Oke Hauser, Creative Lead MINI Living. 'The result is a global network of creative residential solutions in which people all over the world feel at home, while at the same time providing a public space for innovative forms of co-living'. With their individual basic format and elaboration, the various interpretations of the MINI Living Urban Cabin concept demonstrate the creative possibilities offered by micro-apartments. This has made them the forerunner to the first co-living project in China, which is to be opened in Shanghai in 2019. Here MINI is collaborating with Chinese project developer NOVA Property Investment Co. to convert an unused industrial complex in the Jing’An district into a multi-dimensional facility consisting of apartments and work spaces as well as cultural and leisure facilities. In addition to the creative use of space, the concept offers residents maximum flexibility with residential units of varying sizes and a vibrant urban neighbourhood. This creative combination of personal privacy and opportunities for communal interaction is supplemented with an extensive range of digitally bookable services, thereby establishing a whole new level of living quality in the urban setting of a modern city.